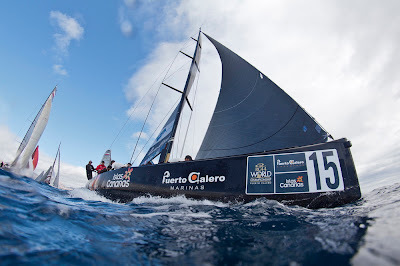 All swords are drawn as the battle for the 2011 RC44 World Championship in Puerto Calero, Lanzarote intensifies. And it couldn't be closer with first and second and third and fourth both tied on points. 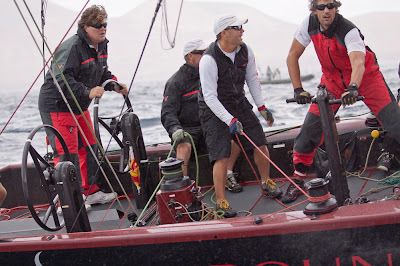 Today's conditions of between 9 and 22 knots throughout the day saw four races to be sailed. Winners included Team Aqua (GBR), Ironbound (USA), Aleph Sailing Team (FRA)and Artemis Racing (SWE). There was plenty of overall lead changes. Islas Canarias Puerto Calero were leading going into the second last race of the day, but Artemis Racing made an incredible comeback in the day’s finale, taking full advantage of other’s mistakes. “It’s close and we got lucky in the last race, Puerto Calero should be leading. Aqua led and we were in second and they twisted their spinnaker which was a little bit of luck," tactician Morgan Larson said. Chants of ‘Puerto Calero, Puerto Calero’ could be heard through the town today. Local support for Daniel Calero, Jose Ponce and the Islas Canarias Puerto Calero team is audible. The team from Lanzarote were the most consistent of the day, adding 18 points to their overall score, but it wasn’t without drama for those watching. In the final race of the day the Spanish team started conservatively in the middle of the line, at the top mark were 13th. Opting for the unfavoured left hand gate, they tacked straight into clean air and were able to sail their own race, rounding the second windward mark in fourth, the position they would hold to the finish. There are two teams who are showing their best form of the season in Lanzarote and go into the final day of the World Championships tied on 41 points, just five points adrift of the leading duo. John Bassadone (Peninsula Petroleum) recruited 18 times World Champion Vasco Vascotto (ITA) ahead of the World Championships and David Murphy’s (Ironbound) new tactician is American Star sailor Andy Horton. Lurking in the background thirteen points off the leaders is Team Aqua. Chris Bake always seems to improve his performance day by day at the RC44 events, so the current RC44 Championship Tour winner cannot be written off to add the World Championship to their trophy haul tomorrow. Forecasters are predicting more breeze for the final day of the RC44 World Championship which doubles as the final event of the 2011 Championship Tour. Three races are planned with racing kicking off at 1130 GMT. 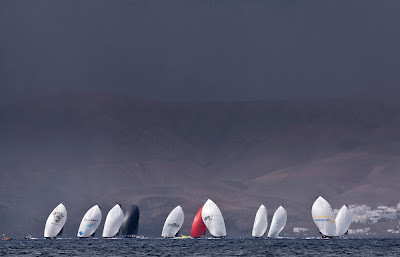 Follow the racing with the live blog at www.rc44.com.